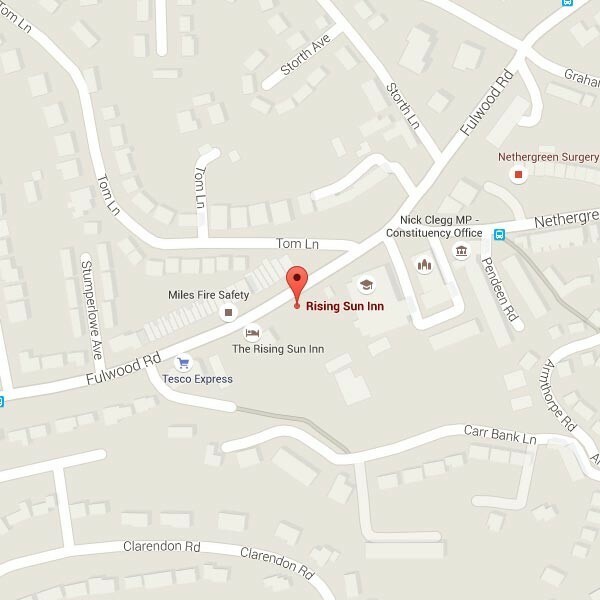 The Rising Sun is a community pub, showcasing 12 real ales. You will be given a warm welcome by our friendly staff, who will be pleased to offer their advice and recommendations on our wide range of drinks. You can take your time whilst you peruse the many different ales to suit every taste, or if beer isn’t your usual tipple of choice, we also have a fantastic selection of wines, spirits and soft drinks. We are passionate about the local community and thrive to strengthen our links with local people whilst showcasing what Abbeydale Brewery do best! The pub has undergone a fantastic refurbishment and extension and we are now complimenting this unique pub by offering traditional British food with a twist. The Dining Room provides a more formal dining setting where you can escape the hustle and bustle of the venue or you can while away an Autumn evening in front of the log burner in the main bar. We have a children's menu and high chairs available, and also offer gluten free options. You can book a table quickly and easily using our booking widget. We also welcome well behaved dogs into the pub and the staff have been known to keep a dog biscuit or two about their person. We have a wide range of keg lines installed on the bar, taking our full offering of lagers, ciders and craft keg ales to 13. This has seen us add Aspall as an additional cider and increased our craft keg offering with rotating guests from breweries near and far, as well as those from our own brewery, Abbeydale. Why not pop in and give them a try?